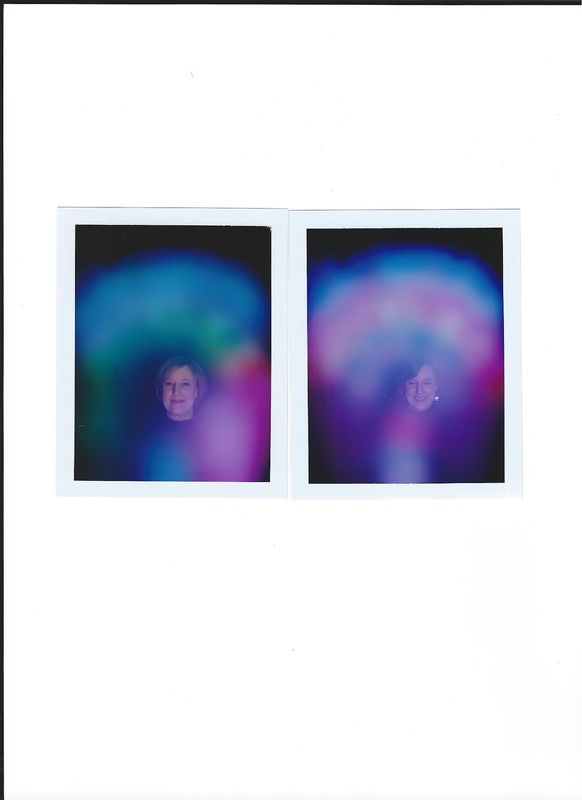 In addition to having pictures of our auras taken at the spirit fair, Brenda and I sat in on another demonstration (Angel Messages) by medium Cyndy Green. Fortunately I remembered to bring my Sony digital recorder because both Brenda and I received messages this time. As usual we are given slips of paper to write our "billets" (french for notes) to whoever we want to contact. We are to write it in the form of a letter - dear whoever - first and last name; or dear spirit or guardian angel or spirit guide. We can ask one or two questions, then we must sign our first and last name. Then we fold the paper and hold it in both hands to impart our energy to the paper. The notes are collected and given to Cyndy only after she has blindfolded herself. Before she puts on a large black blindfold, she tapes her eyes shut. The basket of billets are put on the table in front of her and she will take one or two out and rub them in her hands and on her forehead and will continue to do this for the entire hour. Her individual readings are usually short, just a minute or two. Some are a little longer. All the while I am trying to figure out if there is some way that she could be reading what is on those notes. After about the first fifteen minutes Cyndy said her spirit guide (named Tidbit) showed her best friend from high school who was Brenda and then she saw a fish tank. Brenda's last name is Frisch. Then Cyndy said she saw her uncle Bill so she could have a Bill or William present - Brenda's father's name was Bill. Brenda just wanted to know if her father was happy, but the message she got was rather unexpected. Her father's message was that she didn't pray enough and he felt that he hadn't prayed enough. This was perplexing to Brenda because her father was very devout and prayed every night and Brenda certainly had had enough in her life going on recently that she had been praying quite frequently (or so she thought). We could only speculate that when we actually come face to face to God we will all probably feel like we should have prayed more. A few more readings, then it was my turn when Cyndy said she was "going back to another Sue, Suzanne, Suzette, that kind of name. Someone in spirit . . . she's got babies, a baby like triplets, but three like that, but there are four or five." When she mentioned babies I thought she was talking about someone else, but then she said "She says come here Muffin, Roxie . . . Someone who has lots of babies, now these can be real babies, cat babies or dog babies. She says tell her it's Judy and I've got them all . . . They are all perfect and they are well taken care of." I was floored. I had asked my sister Judy if she had my dogs there, one's name was Miffy and another was Roxie. After listening to the recording a couple of times I realized that when she was talking about triplets she could have been referring to three of my dogs who were Boxers, then Miffy was a Cocker Spaniel and Casey was a mutt. So, as she said "three like that but there are four or five." Then Cyndy said "she says that they visit you and when your feet are down you can feel them when you think you have a bug or fly or an itch below your knee, it's them rubbing up against you. You can feel them." Wow. Now every time I have any little itch I will wonder if it's one of my dead dogs. When a reading is this perfect you have to wonder if there was some trick here because it was just too good to be true. Cyndy is having another demonstration on June 2 and this time I am going to really observe and photograph her taping her eyes and watching her closely to see if she could somehow be reading any of the notes. On Youtube there are videos of her and there is one that shows her taping her eyes before the blindfold - http://youtube.com/watch?v=Cc6-8KujWfU There are other videos of her if you go to Youtube and search the site for Cyndy Angel Messages. I will also ask a question that has an answer that she can't get by reading the billet. With the question I have in mind if she answers with a name like she will need to, then I will believe that she doesn't read the notes. Another thing I learned after these readings and listening to the recording is that sometimes we will hear things that are not said. For example, Brenda thought that Cyndy had said her father's initials (B.J.) - she swore up and down that she had heard them, but I didn't. So after listening to the recording Brenda realized that Cyndy had not mentioned the initials. For some reason I had thought Cyndy had said something about babies being in a stroller, but once again that was incorrect. Our minds were probably trying to process the information and maybe filled in the blanks with what we expected to try to make sense of the information that was given to us. Maybe this is why eye witness testimony is many times deemed unreliable. Just one more reason why it is so important to ALWAYS record any session with a medium and to listen to it a couple of times later. Last Saturday I went to another Spirit Fair with my friend Brenda. 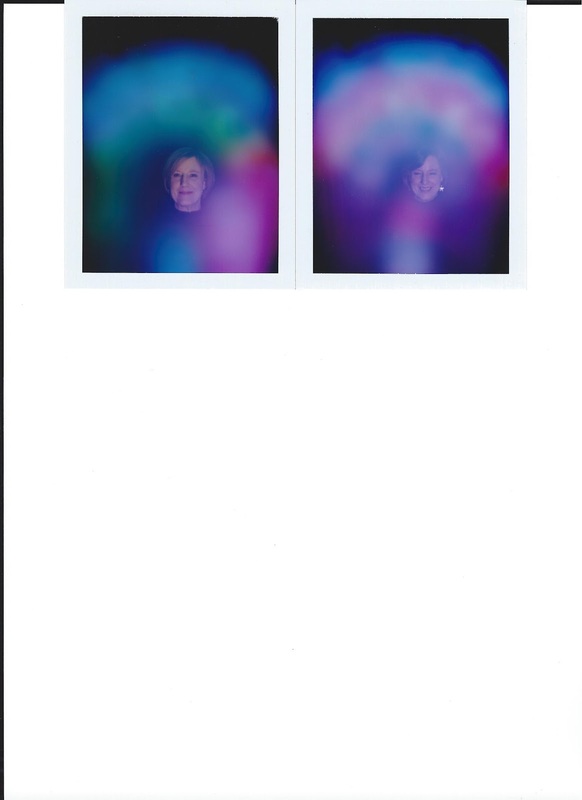 She had just completed her treatment for breast cancer and wanted to get another photo of her aura to see if there was any significant change. I was curious to have another one just to see if it would be similar to the last one I had. Interestingly, both ours were basically like our last ones. 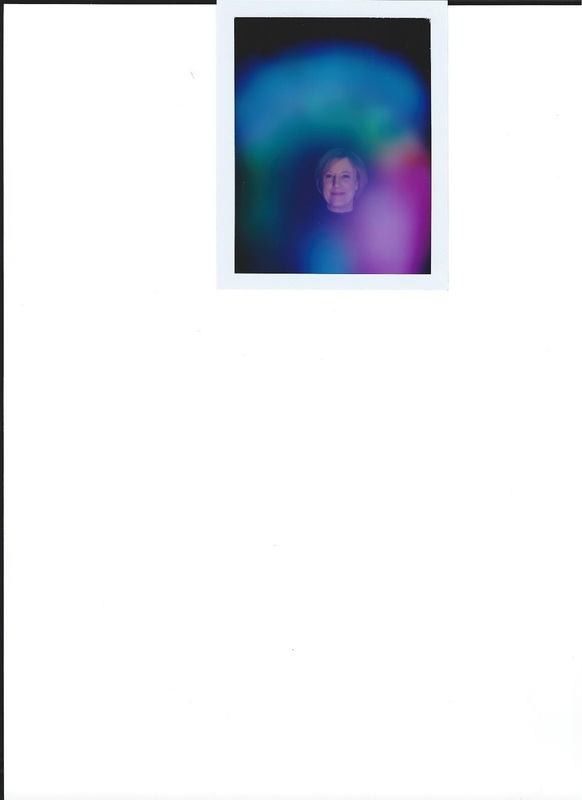 This was Brenda's third picture and hers was still a yellow gold but with more green on one side - which turned out to be the side she had radiation. Mine was still blue but this time the violet had spread more around my whole body. According to information given to us every living being is surrounded by an electro-magnetic energy field. This field can vibrate and fluctuate at different levels which determine the color and intensity of the aura. While sitting for the picture one places their hands on bio-feedback collectors that send messages to the computer to print out the description of your aura. I don't know what kind of camera they use but it records your aura on Polaroid film. Blue - Communication, learning, calm and peaceful disposition, emotional health, faith and trust, inner-voice certainty, clarity, integrity, creativity, melancholy, immaturity, obsessiveness, spiritual arrogance, cold personality. Relates to the thyroid and metabolism. Of course the first nine characteristics describe me. Violet - Intuition and psychic ability, spiritual activity or information, trance mediumship, transmutation, therapeutic healing, protection, heart or stomach trouble, arrogance, superiority. Relates to the pineal and pituitary glands. Honestly, the only characteristic of this color I can relate to is the stomach trouble, which is probably due to the ten or more cups of coffee I have a day. I suppose that sometimes I do have some intuition, but no more than most people. Green - Healing/teaching energy, renewal or change, magnetic abundance, calming, physical discomfort, deception, distrust or doubt, naivete. Relates to the thymus and immune system. White - High spiritual development, consciously applied protection, natural healing, high metabolism, shyness, scattered energy, stress, tension, nervousness, chemical presence. Well, I do have a chemical presence from my anti-inflammatory medication that I take. We were also provided with a description of our photo and what the colors meant in relation to where they are located - center, right or left side. The color on the left (my left) is the vibration coming into my being. The closer it is to you, the sooner it will be felt. A few moments, hours, or as long as a few months. In my first picture you can see there is a violet blob on my left side which meant that spiritual evolution is in store for me. "Violet brings unlimited knowledge. You will encounter the rays of guide energies, the highest vibrational frequencies will be distributed to you." Interestingly, in the second photo the violet has spread all the way around my head so I guess I have unlimited knowledge now. I just have to figure out how to tap into the high vibrational frequencies that have been given me. In my second photo my left side is described as "very bright. A healing is coming for you and those around you. You are not a novice as the beauty of white light attracts all beings at every level of existence. These beings are very loving. They are there to help your evolution. A time to assist others in transition, or to make transitions yourself." Assisting others in transition can relate to my work as a hospice volunteer. which meant that I am spiritually motivated because white has the qualities of all the colors. In my second photo I have blue over my head and I was told that meant "depth of feeling would best describe you. Blue is the blissful fulfillment of the highest ideals of unity, of at-one-ness, of a reunion with earth-mother. It is truth and trust, love and dedication. Peace, tranquility, contentment, tenderness, love, and affection are the qualities most important to you." Of course. Color on the right side of the body is traditionally the energy being expressed. The vibrational frequency most likely seen or felt by others around you. Many times friends will think this is the energy you are made of, however, it is the energy you are putting out to the world. In the second photo I now have violet on my right but this time it means "a healing energy is being expressed. An expression of firmness, of constancy, and resistance to change. --Elastic tension--" Well, that is kind of vague. Over the last few years I have had the opportunity to visit the Crescent Hotel in Eureka Springs. The Crescent was built in 1886 and for the first 15 years operated as an exclusive year round resort hotel. What it is actually remembered for, however, is it's operation as a cancer hospital that was run by a con man, Norman Baker, who claimed to have a new cure for cancer. Tragically many people believed it and went to the Crescent for treatment. Today the hotel has a nightly ghost tour where one can learn the entire story of Mr. Baker and hear stories of the sightings and experiences people have had over the years. They encourage taking many pictures during the tour because you are more or less guaranteed to get a picture of an orb. Before I went on the Crescent ghost tour I never thought orbs were real. I thought they would be too easy to fake so I never thought that much about them. My sister's position on paranormal photography was even stronger since she worked with photography and publishing. She had once commented that anything can be done with photographs today and not to believe anything you see in one unless you taken the picture yourself. I thought that was good advice. One spring weekend in 2006 I went to Eureka Springs with my sister Judy and my best friend Brenda where we had made reservations at the Crescent. We were put in room 313 - which we learned later had a reputation for occasional paranormal phenomena. After depositing our bags in our room we bought our tickets ($15) for the ghost tour, then enjoyed a drink at the Norman Baker Bar before embarking on our shopping spree downtown. The ghost tour is very popular and there was a good size crowd for our tour. We began in the basement area where there is now a spa, although the morgue where the autopsies were performed was further back and probably hasn't changed too much. As we sat on the basement stairs and listened to the lecture we were told to start taking pictures and we would get orbs. I didn't believe it, but started taking pictures anyway. After the first couple of photos I noticed my first orb. I was really shocked. The first orbs show up in front of the glass door to the spa and there is a bigger one in front of the sign to the left. In the second picture the orb in front of the sign has moved to the right and is larger (or maybe it's a different orb) and there are several more further down that look like they are exiting the spa. It's really impossible to determine how big they actually are because we don't know their distance from the camera. Next we went through a long hallway which led to several storage rooms in the back. One of which was used for the morgue. Ghost Hunters have also been to the Crescent Hotel and you can go to their website and watch the episode. Using their infrared camera Jason and Grant caught a full body apparition in front of an old storage cabinet. If it's not staged, then it really is impressive. For more information on this episode go to www.americasmosthauntedhotel.com where you can also see a short video clip of the apparition that was filmed. As you can see in the picture below, I did not capture anything paranormal. In this photo are the two small blue orbs on or near the floor on either side of the hallway that my sister and I both took a photo of. Not a real impressive picture, but it was exciting for us. Our room, however, seemed to be a little more active. We heard the story of how some former occupants of room 313 were playing with a ouija board and being loud enough to generate a few complaints to the management. At one point something happened that scared them so bad they all ran out of the room and would not go back in. A hotel employee had to retrieve their belongings. Nothing that scary happened to us, just a couple of odd things. In the bathroom there is a pedestal sink with a shelf above it for toiletries. As we were sitting in the bedroom enjoying the wine I brought along we heard a clatter in the bathroom. Upon inspection I found that my deodorant had fallen from the shelf into the sink. Weird. I replaced it back on the shelf and it didn't fall again. Back to my glass of wine that I was about to finish off when we heard a "pop". The cork that had been placed back in the wine bottle had actually popped out and flown a couple of feet. I don't know if that was paranormal or not, but that has never happened before or since. If anyone else has ever had a cork pop out of a bottle of wine like that I would like to know. We had more luck getting pictures of orbs in our room. In fact I deleted a lot of pictures from my camera and just kept the good ones. For whatever reason it seemed that I had the best luck getting orb photos whenever my sister was in the picture. I guess they liked her. Maybe it was her perfume . . .
By the second evening my sister was getting a little annoyed with me taking her picture every few minutes to see if there were any orbs. The next two are taken while she was trying to watch TV and there was another orb around her that seemed to move slowly as it had changed position in the next picture. There was at least 15 seconds between the two pictures - I would take a picture then look at it and if there was an orb in it I would immediately take another one. In this picture the orb is by the pillow. What looks like what might be a huge fish shaped orb to the left of the bed is actually a weird reflection from the camera. I found that if I covered up the mirror that would not appear. In the next photo the orb has moved from the pillow to right above my sister's head. It is a little fainter so a little harder to see. My sister hates these pictures. I have seen these same style signs on the roof and windows of another similar building in Branson, Missouri which makes me wonder if it is a franchise. This sign was in the other direction of the condo but still less than five miles from the other business. Sedona, Arizona is well known for having a large population of psychics and healers. The rates there are, however, more expensive; most likely due to the higher cost of doing business. On the main street the psychics are nestled between the souvenir shops. Sign for Psychic Reader second from the top on the left. Since I was with my skeptical husband there was no way I was going to suggest I get a reading with one of Sedona's psychics. However, when he saw the first office for a psychic he did mention that maybe he should consult a psychic about his bad knee that was getting worse. That was probably the closest I will ever get him to even thinking about going to a psychic!